When someone gives you something, your first response is usually to say “thank you.” When a lead provides their name, email address and the other information you asked for, isn’t thanking them the right thing to do? That’s what thank-you pages are designed to do, but they can do so much more when created with the future in mind. 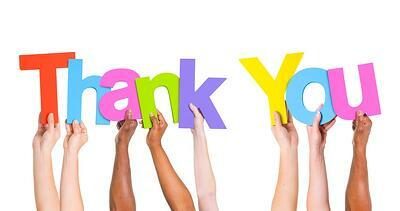 Stop neglecting your thank-you pages...put them to work for you. Here are 7 ways to get started. On a landing page, a best practice is to remove navigation, so the visitor doesn’t get distracted and stays focused on filling out the form. This rule does not apply to thank-you pages! A thank-you page should restore navigation so they can continue browsing your site to find more opportunities to learn about your company. An automatic download leaves people with a positive feeling and can help build relationships with prospects. 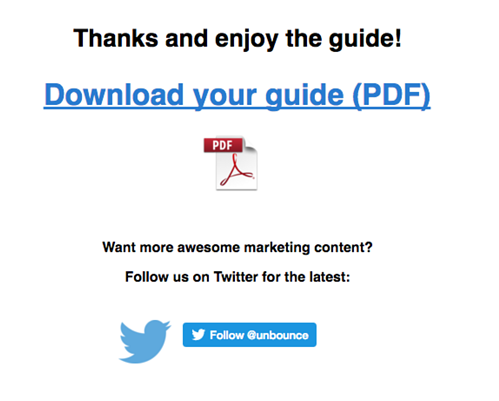 When you do choose to include an automatic download right from your thank-you page, it’s a good idea to go ahead and send a follow up email with the download as well, so they can access it and navigate back to it easily and readily when they need it. A great opportunity to reach additional people is to include an “email to a friend” button like HubSpot does in the example above. It doesn’t get an easier to share with colleagues than that! And let’s not forget about sharing on social media. Thank-you pages are also a great place to include social sharing icons. 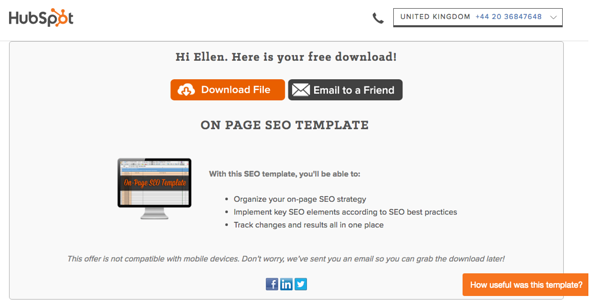 Be sure to link to the landing page as opposed to the thank-you page to avoid missed conversion opportunities. Based on the content the visitor just downloaded, you should have a good idea of what type of information they’re looking for or what they’re interested in. Using that information, include a call-to-action on your thank-you pages for another offer that will help to guide the prospect to the next logical step in the buyer’s journey. Testimonials can be an extra reassurance to the prospect that they’re headed in the right direction. Positive recommendations will add value to your brand. 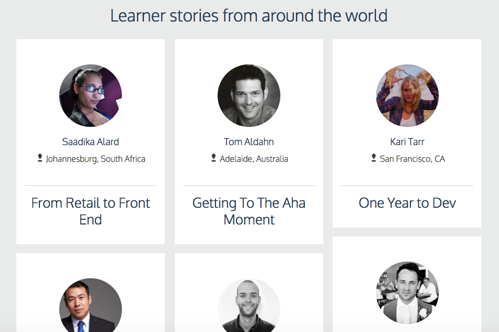 For example, after signing up with Codeacademy, you’ll see a video called “Life Stories,” with these testimonials at the bottom of the page. 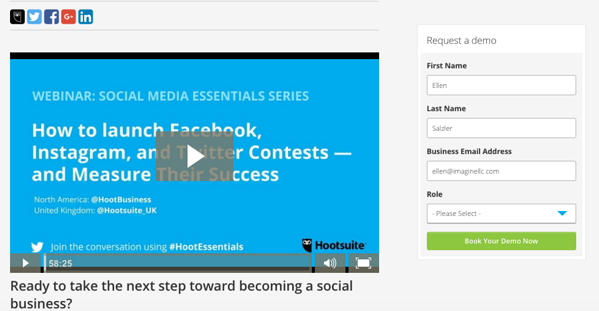 If you’re looking to add subscribers to your newsletter or blog, add an option to opt-in. Offering it to those who are already interested in your written content is a must. It’s a quick way to have them opt-in with one added step, without cramming up their email inbox further down the road. If you keep all of your content in one place or if you have a resource center where eBooks, slide decks, etc. can be downloaded, add a link that directs them to the additional content. They can choose to browse through and find more helpful content that answers any questions they may have or can direct them to the next step they are approaching in the buyer’s journey. Thank-you pages are left out of the limelight. You may never think of them as an important asset to your marketing process, but when optimized, they can be a converting machine for your inbound strategy. If you think you’ll implement these ideas into your strategy this quarter, let me know in the comments below!